From the traditional graham cracker crust -- toasted and sweet with the slightest hint of cinnamon -- to the substantial, creamy center, this cheesecake is a Big Apple classic. Divine with fresh berries and a dollop of whipped cream on top, or enjoyed a la carte by the simply perfect forkful. Classic New York Cheesecake with Graham Cracker Crust. Classic New York Cheesecake is a hand delivered gift. These gifts are delivered by one of our local design centers located throughout the United States and Canada. Same day delivery is available for most gifts when ordered before the cutoff time. 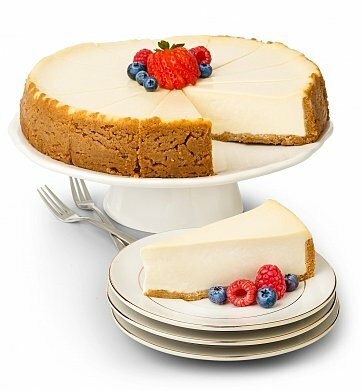 The cutoff time for Classic New York Cheesecake is in the recipient's time zone.